Here we report on just some of the activities that the Saltford Fairtrade Group get up to. The Saltford Fairtrade Group had their annual stall again at this year's Saltford Christmas Market on 3rd December 2016, this time working alongside a local representative (Lyndsey Wright) who had on display Fairtrade products from Traidcraft. Traidcraft is claimed to be the UK's leading fair trade organisation. Their mission is to fight poverty through trade. Established in 1979, Traidcraft's unique structure - a UK trading company and a development charity working together - enables them to build long-term relationships with producers, support people to trade out of poverty and work to bring about trade justice. You can find out more about Traidcraft's work (and order their products) at www.traidcraft.co.uk or you can contact Lyndsey via her email fairtrade@stsaviours.org.uk and she will also be delighted to tell you more about their products and other Fairtrade companies and how to order from them. In addition to the Traidcraft display the Saltford group continued to promote Fairtrade and ran a small raffle which contained a mix of products some kindly donated by the local Co-Operative store. 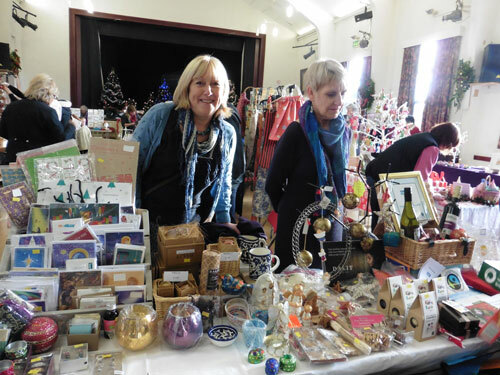 Finally, the group were grateful once again for the support received from the Village Hall and the Saltford Community Association who served Fairtrade tea, coffee and sugar at this and at all their events. The first Fairtrade product sold in the UK was a banana. The Co-operative's first own-brand product converted entirely to Fairtrade was chocolate. 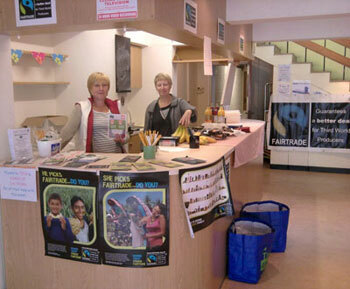 Fairtrade Fortnight is held each year over two weeks in February and March. Fairtrade products are now sold in over 125 countries. Saltford gained Fairtrade Village status in 2013. Fairtrade refreshments at Saltford Manor during the Saltford Festival. At the Fairtrade Group's request Saltford Community Association agreed that the 2015 Saltford Festival would be Fairtrade Friendly. The Fairtrade logo was printed on all of the promotional literature and posters which reached a wide audience both inside and outside of Saltford, and that was just the start. Chris Essex and his team supplied and delivered Fairtrade tea, coffee and sugar to every SCA affiliated venue that served refreshments. The Fairtrade Group donated tea, coffee and sugar to the Guides' and Brownies' open evening events. We are proud to say that Fairtrade products were used at every event at Saltford Hall (who have been Fairtrade Friendly for some time now), The Saltford Golf Club, The Saltford Rowing Club, and Eastover Farm. Following the Festival our hope will be that these venues will continue to support Fairtrade. All of this was made easier by the wonderful support of our local shops. The chocolate treats on the Fairtrade stalls during the Festival were kindly donated by Tesco. The Saltford Co-op have a worthy record of supporting Fairtrade and this year worked together with the SCA and helped keep the coffee cups full, the tea brewing and the wine flowing throughout the Festival. The Bird in Hand and The Jolly Sailor sweetened your tea and coffee using Fairtrade sugar and so the Fairtrade Friendly Saltford message spread. The Saltford Festival will live in our memories and the 'festival buzz' is still with us leaving a great legacy of local togetherness. Please remember that when you buy a bunch of bananas, some castor sugar or any Fairtrade produce you will be supporting emerging country farmers to achieve fair prices for their produce and give them the means to support their families and villages in a way of their choosing. You don't have to go far to buy Fairtrade produce either, it's all in our local shops. A big thank you to Saltford Community Association and the village of Saltford for making Saltford a truly Fairtrade Friendly Village. ask in your local cafés, pubs and restaurants for Fairtrade tea, coffee and sugar + wine and beer! if holding an event, coffee morning, or even a meeting try to supply Fairtrade refreshments. 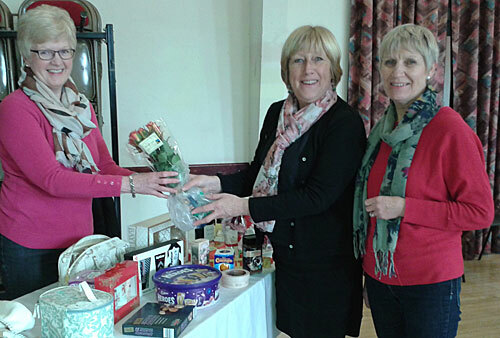 Fairtrade refreshments were served on 23rd February (2015) at the Three villages charity grand coffee morning at Saltford Hall to mark the beginning of fairtrade fortnight. Pictured above are Saltford Fairtrade Group members Gill Self and Frances Eggbeer handing over fairtrade roses, coffee and hot chocolate donated by the Co-op for the raffle. To find out more about what it means to be a 'Fairtrade Village' or how you, your shop, school, business, community group or club can get involved then please contact our local Fairtrade Group by email to saltfordfairtrade@hotmail.co.uk. 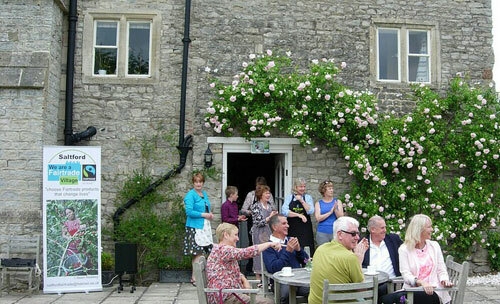 Fairtrade Group serve 170+ at open garden event & prove that Fairtrade tastes good! 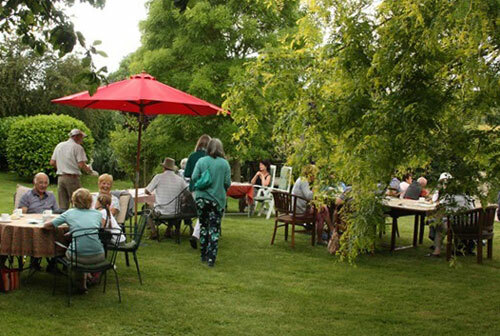 The Saltford Fairtrade Group provided tea, coffee and cakes for the wildlife-friendly garden open day organised by SEG at Eastover Farm, Manor Road on Sunday 29th June 2014. Over 170 guests enjoyed the stunning gardens and the excellent Fairtrade refreshments served continuously throughout the afternoon. 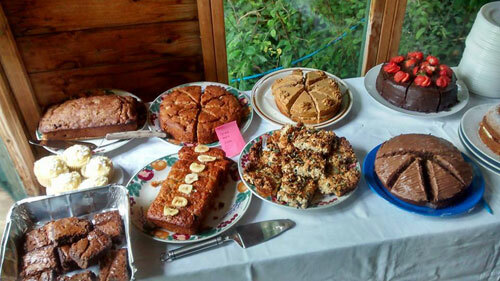 Saltford Girl Guides assisted with the catering arrangements and several SEG members provided home baked cakes (see photo) using Fairtrade ingredients. Many thanks to everyone who assisted with the catering and baking, to the local Tesco, Waitrose and Co-Op stores for donating Fairtrade cake ingredients, and to Saltford Community Association for loan of the crockery etc. 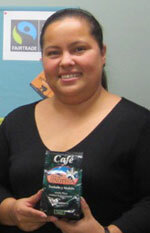 Saltford's Fairtrade Group arranged for Fairtrade coffee producer Margarita Espinoza from Nicaragua to come and visit Saltford on 4th March (2014). The day included a visit and talk to Saltford Primary School and culminated in an informal short talk and discussion at Saltford Hall. Approximately 50 people attended and were treated not only to the presentation but also had the chance to try Fairtrade refreshments including some Nicaraguan coffee. The organisers had even managed to find some traditional Nicaraguan folk music to help liven up the evening. Margarita's talk was enthusiastically received and it clearly demonstrated just what a difference Fairtrade makes not only to her as a producer but also what the funding they receive can do to support their local schools and community helping to ensure better prices, decent working conditions, local sustainability, and fair terms of trade for farmers and their workers. On the wet Monday morning of 21 October 2013, Saltford based 'Signs of Saltford' erected the road signs showing that Saltford has "Fairtrade Village status" on the entrance at each end of the village on the A4. 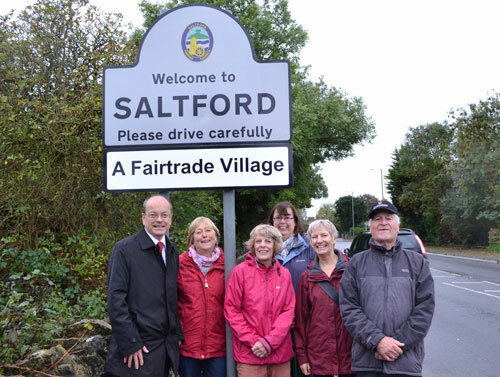 Also pictured here standing proudly by the newly erected sign at the West end of the village is Saltford Parish Council Chairman Duncan Hounsell and members of SEG's Fairtrade Group who have worked tirelessly to achieve Fairtrade status for Saltford. The Fairtrade Foundation awarded Saltford Fairtrade status on 4th April 2013 and our certificate was formally handed over in July 2013. 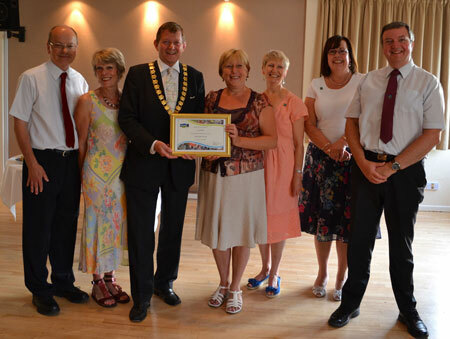 Following the achievement of Fairtrade Village status on 4th April 2013, Saltford formally received this status at a special event held at Saltford Golf Club on 15th July 2013. The village status certificate was presented to Gill Self, the leader of the Saltford Fairtrade Group, by the Chairman of Bath and North East Somerset Council, Councillor Neil Butters. To achieve Fairtrade Village status, the Saltford Fairtrade Group needed to achieve 5 key objectives including the support of the Parish Council and evidence that Fairtrade products are being used and promoted in Saltford retail and catering outlets, workplaces and community organisations. A portfolio of evidence was submitted to the Fairtrade Foundation earlier in 2013. Saltford Parish Council, Saltford Community Association, Saltford School, St. Mary's Church, the Co-op Store, Saltford Environment Group, Signs of Saltford and others gave support and encouragement. Many of those organisations were represented at the Award event. Gill Self said "The evening marked a milestone in a continuing process. We are setting new targets to demonstrate that a significant number of local businesses, organisations and community groups in Saltford support Fairtrade and are committed to using Fairtrade products in the future. Our campaigning continues. We must always remember why we are here and our purpose - increasing the use of Fairtrade products can make a real difference to people's lives and help ensure trade really is fair." Picture a warm, balmy Caribbean evening with cocktails and good food (but in Saltford in February...). Saltford Hall was transformed into a tropical paradise by the SCA where the Fairtrade for Saltford Group made cocktails for a very successful Caribbean evening. After cutting, blending and a few sample slurps we made piña coladas, rum punch and non-alcoholic punch from Fairtrade Rum, pineapple juice, orange juice all decorated with fresh Fairtrade pineapple and lime along with orange slices and parasols. These were greatly enjoyed by the party goers who came back for seconds. We were asked to draw the raffle which also included a donated bottle of Fairtrade champagne. This gave us the opportunity to tell the assembly a little about Fairtrade produce and the aims of the campaign, Fairtrade for Saltford. We were also able to provide bowls of Fairtrade nuts to go on the tables which were also donated. Thanks go to The Co-op and Tesco who made these donations and are a local source of Fairtrade products. Cllr. 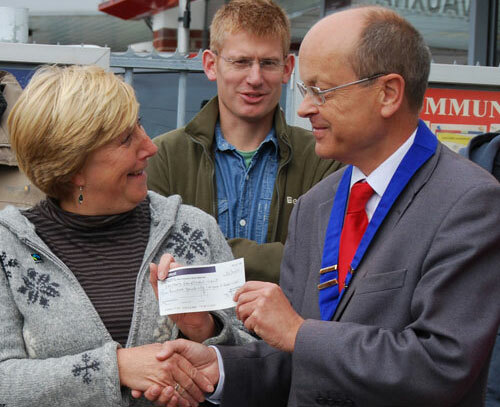 Duncan Hounsell, Chair of Saltford Parish Council, is pictured handing over a cheque for £200 to Gill Self, leader of the Saltford Fairtrade Group, on 30th September 2012. This was to mark South West Fairtrade Day held recently (on 22nd September). The South West is a leading region for Fairtrade and Saltford Parish Council's support of Saltford Fairtrade Group is one of five goals to be met to secure Fairtrade Village status. Gill Self hopes that Saltford can obtain Fairtrade Village status during 2013. 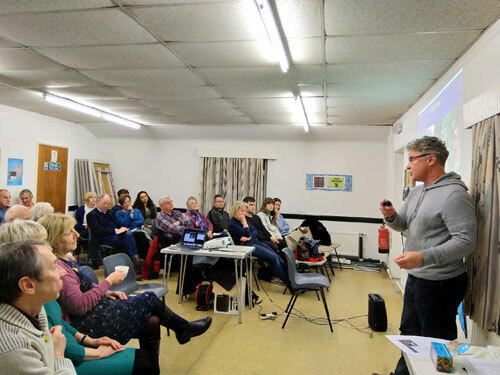 Saltford Fairtrade Group is working with the Parish Council on Saltford's Fairtrade status and is undertaking a fact-finding audit of Saltford businesses and community groups' knowledge and use of Fairtrade products. The Group meets regularly to plan activities to promote and encourage the use of Fairtrade products at new or existing events around the village. Contact is being made with businesses and key organisations within the village to encourage the use of Fairtrade products. If you use any Fairtrade ingredients you can call the pud or cake Fairtrade, but of course the more you use the better, aim for 2 or 3. The list below is not exhaustive and there are lots of other places where Fairtrade ingredients are available (including Waitrose). We have tried to think of the easiest/local shops even if most are supermarkets. This is a constantly changing situation so if anyone has any comments or additions please email them to: saltfordfairtrade@hotmail.co.uk. Always use Fairtrade sugar - available at the Co-op, Sainsbury, Tesco, Lidl and Oxfam. ALL Tate and Lyle sugar is Fairtrade. You can get castor, soft brown and demerara. Use Cadbury, or own brands available in Co-op, Sainsbury, Lidl or Oxfam. Available in all supermarkets but not necessarily in veg shops. Available in most shops but make sure it is Fairtrade. Cashew, brazil, nuts and raisins - available in Tesco. Fresh from Co-op, Longlife from Lidl. Available from W.F. Buss, Keynsham. Also Barts Herbs and Spices. There are lots of Fairtrade recipes if you Google search them, a good site is www.fairtrade.org.uk; this also tells you where else to source the ingredients. Although our wonderful diverse weather doesn't allow us to grow bananas and coffee beans, our local producers work hard to keep us supplied with wonderful produce as well so buying local is something to think about when we do our shopping. A fair price for their products and our support can make a difference to them as well. Following representations by Saltford Environment Group (SEG), Saltford Parish Council voted on 6th March 2012 to support the idea of Saltford becoming a Fairtrade Village. Fairtrade is about better prices, decent working conditions, local sustainability, and fair terms of trade for farmers and workers in the developing world. 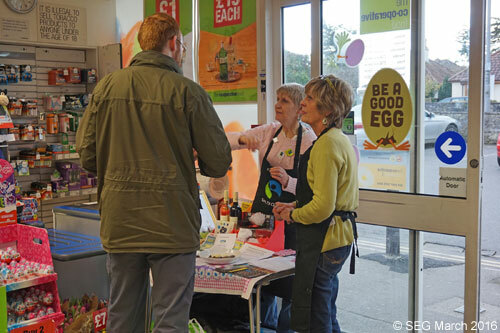 SEG are grateful to the Co-op in Saltford who hosted and supported a Fairtrade tastings stall to launch and promote our Fairtrade activities on 10th March 2012. 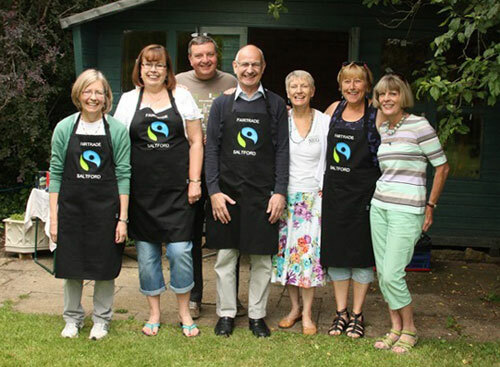 A Steering Group ("Saltford Fairtrade Group") was established by SEG with support from the Parish Council and this group is co-ordinating and promoting action on our Fairtrade status. The group also maintains close links with the Keynsham Fairtrade Group - Keynsham has been a Fairtrade Town since February 2005. 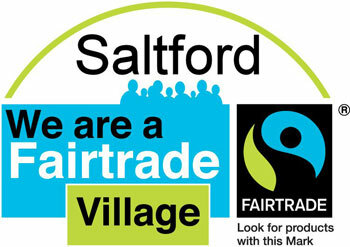 Saltford received its "Fairtade Village" status on 4th April 2013. (i) Local council passes a resolution supporting Fairtrade, and agrees to serve Fairtrade products (for example, in meetings). (ii) A range of Fairtrade products are readily available in the area's retail outlets (shops, supermarkets, newsagents and petrol stations) and served in local catering outlets (cafes, restaurants, pubs). (iii) Local workplaces and community organisations (places of worship, schools, and other community organisations) support Fairtrade and use Fairtrade products whenever possible. (iv) Media coverage and events raise awareness and understanding of Fairtrade across the community. (v) A local Fairtrade steering group is convened to ensure the Fairtrade Town/Village campaign continues to develop and gain new support. If you would like to get involved with supporting the Saltford Fairtrade Group as a volunteer or if you have any queries, you can contact us by email: saltfordfairtrade@hotmail.co.uk. If you would like to know more about Fairtrade history, products, and producers etc, visit the Fairtrade Foundation website: www.fairtrade.org.uk. SEG has also raised the issue of Food Security in the context of protecting our Green Belt agricultural land. See our special feature item on SEG's Green Belt page from this link: Food Security and the Green Belt: Who feeds Saltford? << Sourcing Fairtrade ingredients etc. 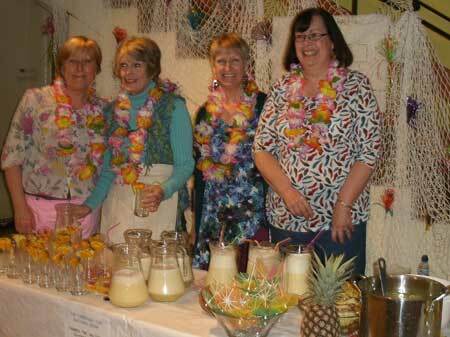 Fairtrade Group members Gill Self and Frances Eggbeer staffing a Fairtrade Refreshment 'Bar' at a Saltford event.